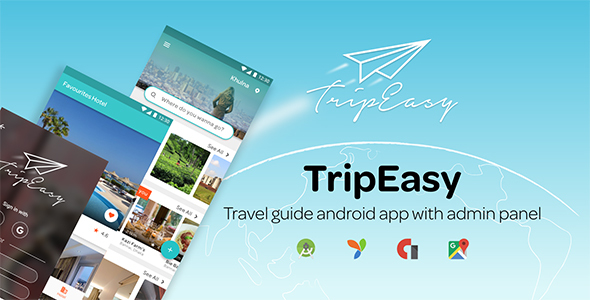 TripEasy is a complete android Trip advising / travel guide application template.This travel app template is built using native Java language in Android Studio. The code is user-friendly and well commented. The cheezy part is, it has an admin panel with a lot of features. It offers more than 20 screens. All screens are well design and functional. Also, the screen can be customized. You can add nearby places, restaurants, hotels in your application as per your requirements. You can connect Google map with the app. With built-in Google interstitial AdMob and google banner Admob, it takes only a few seconds to add banner throughout your app & show interstitial advertisements. User can log in with Google and Facebook without creating an additional account to use this app. It has also email verification option to verify his/her account. This application has a high UI material design. This travel guide app template is very easy to install and customize. You will get all the basic knowledge for set up. Still, We have a dedicated support team to help our customers.